These are special photographic techniques that have long been used for many years by both professional and amateur land photographers to add creativity to an otherwise boring shot. In its simplest form, panning is either when the photographer is stationary and the subject is moving, or both photographer and subject are moving at the same speed. Let’s take the first one first. Using a diver as a subject getting him to swim past you at a set distance is the easiest way to test and perfect this technique. The key to success is a fluid panning action, usually from right to left and the correct shutter speed for the job. Using a D200 in a Sea & Sea housing with a 20mm lens set at f16 1/4th sec exposure, which makes the best use of available light, allow the diver to swim parallel in front of you. Then, start moving the camera to match the speed of the swimming diver. Before he is directly in front of you, when the panning speed of the camera and swimming diver match, gently press the shutter. It is important that the panning action starts before and carries on after the shutter has been pressed to create fluidity in movement. It needs practice to achieve. It is also important to bracket the exposure to see which shutter speed f stop combination gives the most artistic result. In this instance, I would also use f11 at 1/8th sec and f22 at ½ sec. 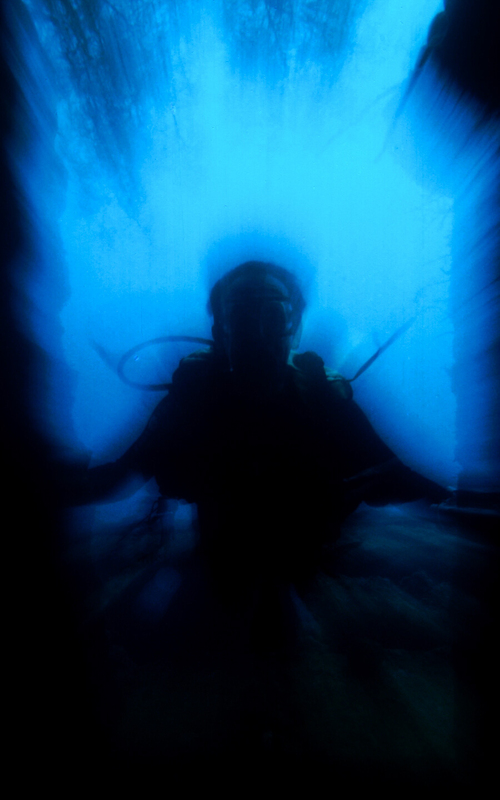 What you will end up with is a photograph of a diver, his torso frozen, limbs moving and a blurred background, giving exaggerated motion to the subject. This can easily be practiced in your local swimming pool. The second technique is when the photographer and subject are moving at the same speed and can be applied simply when swimming down a reef knowing that you have a good chance that you will come across certain subjects. The important thing to remember in this situation is that the intent is there, and your camera set up must be ready if the opportunity arises. There is a reef in Indonesia where I come across hawksbill turtles frequently. My D200 is set at around f16 at ¼ sec exposure (dependent on the ambient light reading), so when the turtle swims off the reef into the blue, I am ready matching my speed, hopefully, to that of the turtle. I position myself over the top of him and press the shutter, which freezes his image but allows the background to blur, again, giving an impression of great speed. The key to success in this situation is matching your finning speed to that of the subject. When these match, the chance of success greatly increases. When we take a photograph with flash in its normal mode, the flash fires as soon as the shutter is activated. In other words, at the very start of the exposure. When we put the flash mode to rear curtain sync, the opposite happens. The flash fires at the end of the exposure. So if we had an exposure of ½ a second, the flash will not go off until the very end of the ½ second. Once again, we are going to use rear curtain sync in conjunction with long exposures to create an exaggerated sense of movement, and when the flash goes off at the end of the exposure, it will freeze and add colour to the picture. The reason for using rear curtain sync is that the long exposure will record lines of movement which can be very haphazard and jumbled. But when the flash fires, it records the final image on top of all the movement giving a sharp picture of the subject. If, for instance, we did exactly the same thing but using normal flash mode instead of rear curtain sync, then we would have a final picture of the subject covered with movement from the rest of the exposure, which would make it very indistinct. Again, practice this in the pool. I have been using wooden coloured fish, which are always on the move and give a good representation of the final image one could achieve in open water. Using a D200 in a Sea & Sea housing with twin strobes set to manual full power main light YS300 fill light YS120, in open water, I pick a subject not to small which is not likely to dart around too much. Lionfish have worked well for me in the past as a starting point. I take an ambient light reading with emphasis on a long shutter speed. I recommend bracketing around a ¼ of a second. I set the flash mode to rear curtain sync, compose my photograph and fire. Head shots sometimes give an indistinct end result, whereas a side view, I feel, gives a recognisable sense of the animal. With distinct lines of movement, it can enhance the colour of the background, so choose one with saturated colours. Obviously, the shutter speed is key to the final image—½ a second and longer will give an image with very distorted movement and not so sharp an end result, whereas a shorter shutter speed of say 1/15th a second, will give slight movement around the fin areas and a very sharp final image. It’s all a case of what you like, but again this technique adds impact and drama to many photographs. Note: When the two techniques above have been practiced, for the more adventurous, try combining them both in the same shot. The panning will give lateral speed lines, and the rear curtain sync will give a sharper more colour saturated final picture— again, practice achieves results. This is exactly what the heading says. Using a zoom lens, we can use a technique to make static subjects look like they are travelling at very high speed. I liken it to watching the Starship Enterprise on Star trek just as it is going into light speed because those flowing lines around the spaceship are the exact results you will get when you use this way of taking a photograph. Typical subjects are wrecks, highly coloured soft corals, and divers in a stationery position. This may sound complicated but it isn’t. You will get the best results by using a lightweight tripod weighted down with some lead. But if this is too much, then excellent results can be achieved by anchoring yourself in a steady position before shooting. Again, practice this technique in the pool before shooting in open water. Fluidity of movement again is a key to success. So, in open water using a D200 with a Nikon 17 to 35mm zoom lens in a Sea & Sea housing attached to a lightweight tripod, choose a likely subject—perhaps a diver in the doorway of a wreck. Set-up the tripod at a distance far enough away so that when you zoom on the focal point it stays within the picture area. Take an ambient light reading again with emphasis on a long shutter speed. I find between ¼ and ½ a second gives good results. Starting at the 17mm end of the lense practice zooming through to the 35mm end. This is where the fluidity comes in again, the zooming must be a constant speed. When you are ready to take your shot, start zooming first, then fire the shutter and continue zooming after the exposure has been taken. This will give a constant image with no jerkiness to be seen. Again, bracket the exposure. In this case, I would bracket around ¼ second using 1/8th and ½ second with the appropriate f stop. The speed of the zooming will obviously give different results —faster, a more distorted image with longer speed lines—slower, a more distinct image with shorter lines. Obviously, if you are deeper than 10-15 metres, then the final image will be very desaturated in colour. So, once practiced, this technique can again be combined with rear curtain sync. You will get all the speed lines but a more distinct sharper image with good colour saturation. I have tried to keep the explanations of how these three techniques work as practical as possible with the intention of allowing photographers the opportunities to get in the water and experiment without too much technical jargon, which can sometimes be confusing. I hope this intent has worked, and in some of you, it will lead to a more creative way of thinking and a greater awareness, which will eventually lead to a form of underwater photography leaning very much towards artistry. If I have not achieved this aim with my explanations, please do contact me, as I will always endeavour to help where I can.